One listen and you will quickly know. Hank III, born Shelton Hank Williams, is an acquired listen. However, on saying that, if you like what you hear from this stubborn modern day outlaw, one offering a punch and a kick to the established ideals of what many consider country music, then you’ll understand, and quickly, that it’s about the music more than the cha-ching of an in-tune industry cash register. Simply, Hank III is a maverick. He does not tread the well-marked Music Row pathways, his route is diverse and off the Nashville beaten track with its hunks, hats and contrived images. The son of Hank Williams Jnr and the grandson of the iconic Hank Williams, Shelton treads his own weary path. Space does not allow a complete resume of Hank’s boy. However, underneath the crumpled hat and the multicolored etched arms beats an ambition to keep tradition alive. Shelton’s family legacy arrives well known – there have been the stories, some tall tales but mostly well founded, of his dad’s pill poppin’ and depression, and the legendary death of his granddaddy before the tarnished age of 30. This sometime punk rocker with the thrash metal leanings entered country music in a manner befitting one of his granddaddy’s tunes. Shelton owed the court money. A lot. It seems there was a sum of $60 000 in overdue child support involved, the result of a one-night affair, which had occurred three years before in 1995. To beat the debt, he did what anybody with a name to sell would do; he turned to an asset his was overly familiar with – music. He signed with Curb Records, delivered up an album of which he is now bitterly disappointed, Three Hanks: Men With Broken Hearts. The album was a cut and paste of the three men, designed one would suspect to give the perception of a unified legacy. 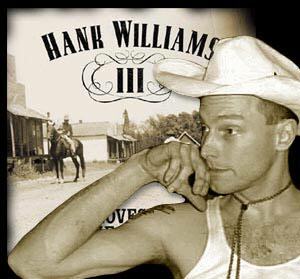 Several albums on Curb, again disastrous and outside the wanted creativity of Hank III, saw litigation and court, as Hank aired his contractual dissatisfactions. Now with his fourth and final Curb outing, Hank III, who not only has the appearance of his long departed grandfather but also the vocal similarity, delivers an album that looks at life the way it is, as opposed to the should be ideal. Listening to these 10 self-penned and one co-written tunes, you come away with the distinct opinion there has been more than DNA coursing through the veins of Shelton Williams. Rebel Within is a honky-tonk driven reveal on tunes that trace depression, drinkin’, addiction and the toll it exacts, dysfunctional bonds and family. It is an acquired listen. With Hank III as producer, the album is unapologetic. It is uncompromising. It is raw, true. However, it is like the music we have come to expect from this artist. The fusion of country, power punk, hellbilly, alt country and hard played twang is as biting, as it is exciting. Now with the freedom on cutting the ties with Curb, fans and the curious alike can only speculate what his next album will bring. For now, Rebel Within serves as a timely introduction to those possibilities, as does his back catalogue. Standout cuts are “Getting’ Drunk And Fallin’ Down” a ode to getting wasted; “Rebel Within”, and the karaoke fun of “Drinkin’ Ain’t Hard To Do”, and at 6.32 the album’s longest cut “#5” is a stark and real look at the truth and evils of addiction.